It seems like over the past couple season the name C.C. Sabathia and burnout candidate have gone hand in hand and with good reason. Since entering the league in 2001 at only 20 years of age he's thrown nearly 16,000 pitches which definitely gives him one of the heavier workloads in the past 5 years. He's handled it quite well and has actually never been on the disabled list having only suffered a few minor elbow and shoulder injuries. Last year he had one of his best seasons to date going 15-10 with an ERA just over 4. That may not sound that great, but after July he was 9-1 with a 2.24 ERA. How likely is it that C.C. Sabathia will pick up where he left off in 2006? For starters the decrease in his ERA was fueled by an excellent strikeout per 9 innings (K/9) of 8.7 during the final two months of the season. 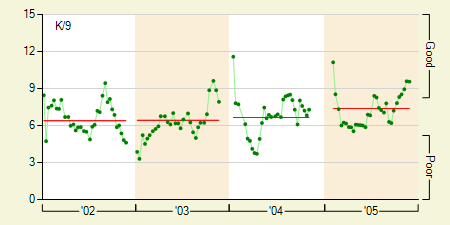 He's shown late season surges like this before in 2003 and to some extent 2004, but never quite like this one. If we break down his K/9 a little further by right-handed and left-handed batters it becomes quite obvious what happened. It looks like he figured out how to strikeout left-handed batters while there wasn't so much improvement against right-handers. The increase is rather severe, but the sample size is also a little small as only 16% of the batters he faced were left-handed. However the consistency of the increase throughout the year makes me want to say that it wasn't entirely a fluke. The other area he showed improvement in was his walks per 9 innings (BB/9) which he managed to get down to a career low 2.8. Everything seems to be headed in the right direction for C.C. Sabathia. 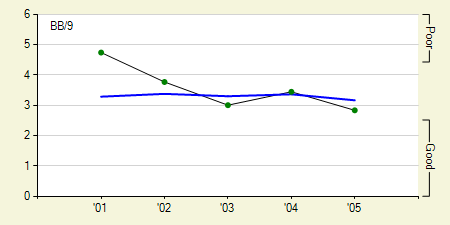 His strikeouts are up, his walks are down, and it looks like he really did show some good second half growth in 2005. It's also worth mentioning he took his groundball tendencies to new levels (mostly against left-handed batters, 3.0 GB:FB). 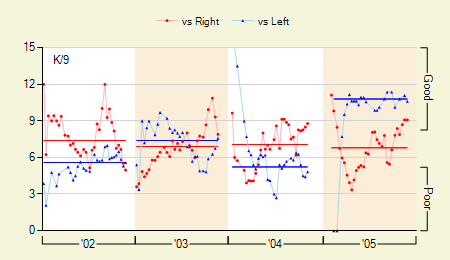 While I certainly wouldn't expect him to continue pitching at the level he did in August and September, there's no reason he can't improve upon his 2005 season. He's already a solid pitcher and has showed that at times he's definitely capable of being an excellent pitcher. He'll only be 26 years old next season and maybe a little consistency is on its way. We hoped you liked reading Daily Graphing – C.C. Sabathia by David Appelman!